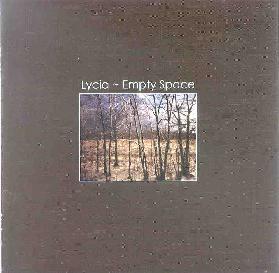 Lycia began life in 1988 in Tempe, Arizona as a solo project of Mike VanPortfleet. Soon becoming a band, Lycia recorded several albums over the years, experiencing several lineup changes, until 1999 when VanPortfleet ended the band and retired from music during the recording of Empty Space, which now sees the light of day thanks to the folks at Silber. Joining VanPortfleet (guitar & vocals) on Empty Space are John Fair on drum programs, David Galas on bass and Tara Vanflower on vocals. I've not heard any of Lycia's other albums but the promo sheet notes say that Empty Space is the closest Lycia has come to making a pop-oriented album. The music in some respects recalls 80's synth-pop, but by that I don't mean fluffy Flock Of Seagulls or that kind of crap. The melodies are indeed catchy, but Lycia have a darker, gothic sound, heavy on atmosphere and with a spacey ethereal vibe. There's a simplicity to the music but the melodies are completely absorbing and the soaring guitar notes inject a cosmic edge into the music that can only be called pop because of the melodic style. Mike sings on some tracks and Tara on others, both making their mark on the songs while retaining the distinct Lycia sound. Tara's vocals have a punky but pleasant feel which (particularly on the song "Persephone") reminds me of Deb Young from Architectural Metaphor (that'll attract the space rock fans attention). The songs with Mike's vocals tend to be heavier on the gothic influences, "Hope Is Here" being a highlight and one of my favorite tunes of the set. Lycia also excel at instrumentals, a standout track being the spacey "You Can Never Go Home Again". Overall a good mixture of spacey gothic influences in a pop context. If these are among their more pop-oriented songs I'd be interested in hearing some of their other work. Empty Space is distributed by Silber Records. You can visit their web site at: http://www.silbermedia.com.